Leander Games may well have a hit on their hands with Dragon Slot Jackpot. The name for this game may be a bit generic but wait till you see this pokie’s graphics. 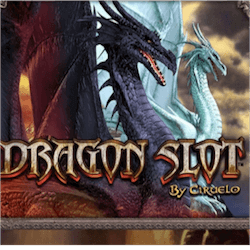 With designs inspired by the famous fantasy artist, Ciruelo, Dragon Slot Jackpot looks the business. It is also fully compatible with a host of devices, including Smartphones so you can take this epic game on the go with you. The graphics aren’t the only draw here. There is a progressive jackpot feature available along with a standard in game jackpot of 12 500. The RTP is a quite high 96.59%. Wagers start off as low as 0.01 but you can raise the coin values of your stake up to a total wager of 100. While playing with a higher wager amount will increase your winning odds, at the end of the day the Dragon Slot Jackpot progressive jackpot is awarded randomly. All the main picture symbols along with all the bonus icons are represented by majestic looking Dragons. The reel symbols include, in ascending order of value, a blue, red, green, white and black Dragon. The black dragon can award up to 2500 as its prize. The Yellow dragon is the Wild icon in this pokie. He purely substitutes for the required symbols to complete a payline. The dragon scatter symbols will award prizes no matter where the icon lands, as long as you can land 3 or more on the dragon reels. This scatter offers a maximum prize of 100x your staked wager. Dragon Slot Jackpot has two main bonus features. The first is the epic Dragon Fight bonus. This feature is activated by 3 dragon bonus symbols. It can be tricky landing them as they appear exclusively on reels 2, 3 and 4, but when this feature activates, get ready. You will be taken to a screen here the white and the red dragons fight each other. All your winnings in this feature gets multiplied by your staked wager. There is also a free spins bonus feature. It is activated by the armoured knight free spins symbol. These icons appear only on reels 1, 3 and 5 and you need 3 onscreen to initiate the free spins round. You get 10 spins in this bonus feature plus you get to select one of the dragons to fight the free spins knight. Dragon Slots Jackpot may have a generic name but it is a fantastic experience all round.